How to reach Rome's cruise port from Ciampino Airport (CIA) by public transportation. 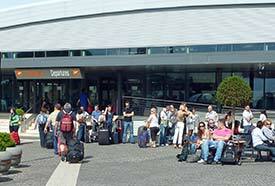 ABOVE: Travelers wait for a Terravision coach outside Ciampino Airport's arrivals and departures terminal. From Ciampino Airport to Rome's Termini Station by coach, or or local bus and Metro. From Termini Station to Civitavecchia by train. Total travel time is anywhere from two to three hours, depending on your transportation choices and how long it takes you to make the connection at Termini Station. Fares are reasonable: €10 or less for the entire journey. For articles about Civitavecchia and its cruise port, please go to our Civitavecchia (Port of Rome) index page.